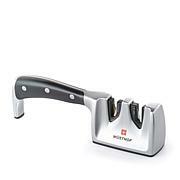 Keep your kitchen cutlery razor sharp with these tungsten steel knife sharpeners. 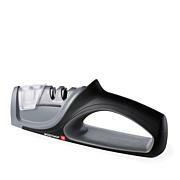 Use the suction base to secure it to your countertop, then watch as your blades will sharpen and hone with just a few strokes. 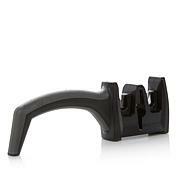 I was in need of a knife sharpener when I saw this one demonstrated on HSN, . . . it's small, but does get the job done. so far, so good. 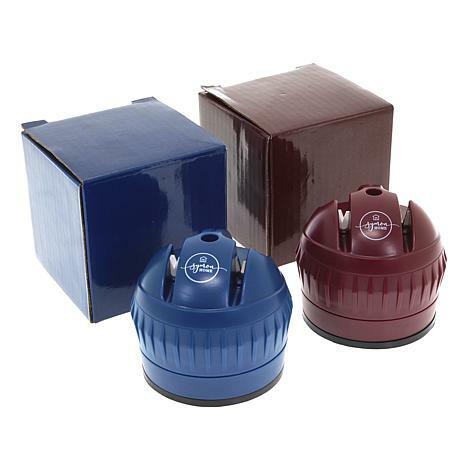 These knife sharpeners really work great. Easy to attach to the counter and then run your knife through a few times and you now have a sharp knife to use in the kitchen. Well worth the money and love the design, so easy to store in kitchen drawer and bring out quickly. The knives in my knife set were getting dull. I didn't realize how dull until I used this! So easy to use and very quick. Now instead of buying new knives, I can sharpen the ones I have. If you have knives, you need this product. 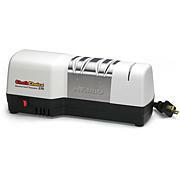 This little sharpener sharpens very quickly and renews my knives. I thought I needed new knives but I wanted to try this first. Family members have noticed my knives areSharper. I bought two sets and gave to each of my three daughters and myself.